Since 1989, LICM has served as a Long Island cultural icon. The museum serves over a quarter million visitors every year, making it the most popular museum on the island. 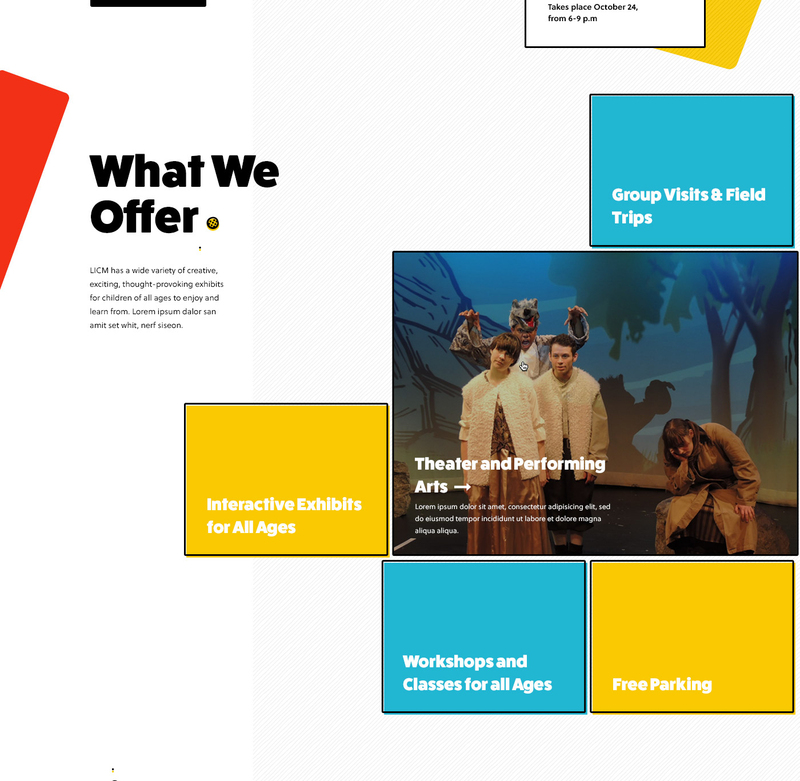 We created a site to reflect the spirit of the museum as not just an exhibition space, but a place of learning, where the programs and performances fuel creativity and collaboration. LICM needed a practical, accessible and future-facing site for a diverse audience of parents, teachers, and educators. The site would capture the fun-loving, DIY spirit and vibrancy of the museum to attract new visitors and audiences. We took cues from the personality of their organization, and worked closely with their team to rethink and redesign the online LICM experience, culminating in a whimsical yet sophisticated website that captures the essence of the Museum in an easy-to-use mobile-friendly format. The Long Island Children’s Museum is more than an exhibition space - it is a place of learning, which fosters creativity and curiosity. We kicked the project off by visiting the museum and learning more about their programs and interactive exhibits. This exploration was critical for understanding how people experience a visit to LICM, as well as giving us insight into their educational mission, which we then strove to replicate digitally. The Long Island Children’s Museum is more than an exhibition space - it is a place of learning, which fosters creativity and curiousity. We kicked the project off by visiting the museum and learning more about their programs and interactive exhibits. This exploration was critical for understanding how people experience a visit to LICM, as well as giving us insight into their educational mission, which we then strove to replicate digitally. 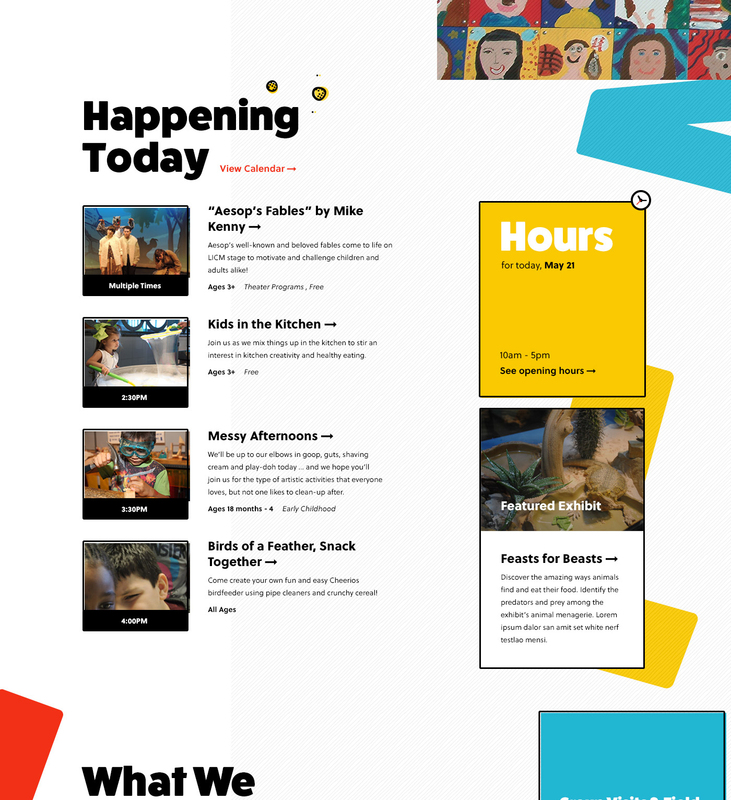 We needed to completely rethink and redesign the site to be accessible to all prospective museum visitors, while providing LICM with a solid foundation and the tools to grow their web presence over time. We re-architected the navigation and sketched out the paths LICM visitors take when going to the site to ensure that workflow scenarios for each audience type were accounted for and designed for optimal usability, including on mobile. Not only were we focused on a cohesive end-user experience, but we wanted to make sure that the administrative experience was just as intuitive. Knowledge of how the museum promotes events, exhibitions, membership, and online educational content gave our team user context, and allowed us to recommend where to place calls-to-action on key pages and drive engagement through social tools. As the Museum is nears its 30th anniversary, there is much to celebrate. It's so much more than just a place for a family to spend three hours on a rainy day. While never distracting from the primary user needs of hours and admissions information, the goal of the website was to help the public understand the depth and breadth of their programming and offerings. Beyond the stimulating and exciting permanent exhibits, the museum proudly features numerous shows and programs that are funded by corporations, individuals, or government funds and these and future "partners" were an important audience to consider in the design of the site. Building the brand awareness and reputation that opens the doors to more funding and programming is a less obvious call to action than ticket buying, yet one that we subtly wove into the strategy, design and structure of the site. We worked collaboratively with LICM’s in-house designers, to refine the brand colors, typography, use of imagery, and general design approach by using mood boards to explore potential directions. Our experience at the museum framed the foundation of the website’s visual aesthetic, the illustrations and icons reflecting the emotions experienced by kids at the museum: a sense of exploration, curiosity and genuine fun. 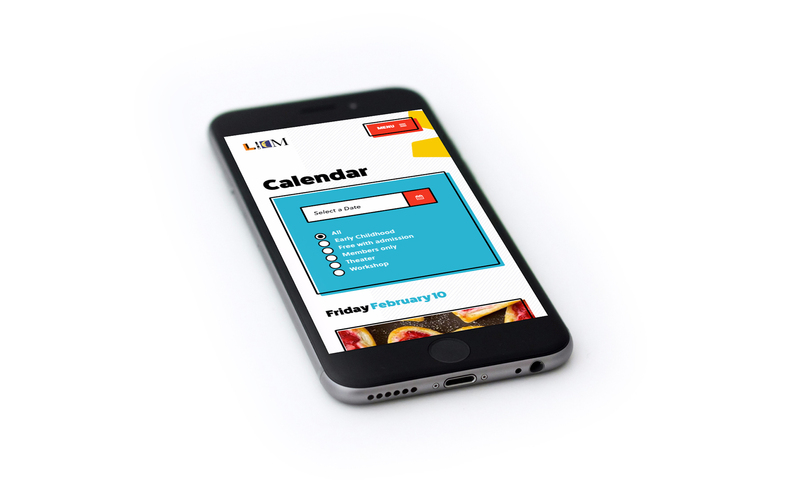 We overhauled LICM’s calendar page with an easy to scan, mobile-friendly design. A date picker as well as filters to select specific event types helps users to find what interests them quickly and efficiently. A flexible user permissions system allows the LICM team to collaboratively update content throughout the site, on an easy to use Django CMS. The new site supports promotional areas to highlight pages, announcements, and other pieces of content that can also be easily edited through the CMS. As a certified Blackbaud Partner, we were able to take their usage of Altru to the next level. Previously, they were only using Altru for theater ticket sales, and the end user experience was jarring and disconnected. Today, the Altru integration is seamless, visually on brand, and has expanded to encompass admission sales, memberships, and donations, in addition to theater tickets. As a certified Blackbaud Partner, LICM knew they could count on our team to take their usage of Altru to the next level. Previously, they were only using Altru for theater ticket sales, and the end user experience was jarring and disconnected. Today, the altru integration is seamless, visually on brand, and has expanded to encompass admission sales, memberships, and donations, in addition to theater tickets. This video takes a deeper look at the project approach and the research and design processes used in the creation of the this project. The website now captures the ethos of the museum and the value it brings to visitors, educators, and students and gives LICM a platform to easily keep their audience informed and engaged.